The Diary Of A Roller Derby Rookie: My 4th(ish) NSO Role & International Incident! Well! I was very fortunate this weekend as I got to NSO at my first ever international event! There were two bouts and I got to NSO for both. The HNSO who asked me to officiate at this bout had said that they were looking for "international standard" NSOs and I can understand why. It is the same job but it is upped a level. The skaters are faster, harder, better and the game seems way more intense. Normally with line-up tracking, if I can't see a number on the pivot line, then I will find it as they're skating round. But the packs move a lot faster, the skaters are recycling more, they're never in the same place! They certainly keep you on your toes and that just makes it even more fun! My next role was Penalty Box Timing for the men's game and my chance at a new skill. I have done penalty box timing before, using a stop watch per blocker but I got to use a different technique this time! One stop watch plus paperwork. This might be normal practice to some people reading this but it was completely alien to me and the rest of my league. I got a chance to practice it at a scrimmage but the team were being really good and I didn't get too many players in the box! Essentially, you have one stop watch per penalty box timer, including the manager, but just the two timers have a clipboard with paperwork. When a skater comes in the box you have to start timing the minute, then write on the paperwork the jam number, the player's colour, their number, position and then the time you start the stopwatch, what time they have to stand and what time they're done e.g. If Red 52 came into the box during the 5th jam then it would be: Jam 5, Red, 52, B (for blocker), 0, 50, 60. Now, that's easy enough. It starts getting more complicated when another blocker comes in. You have to look at the time it says on your stopwatch when they sit down, take that as your start number and then do some quick maths to work out their stand and done times. E.g. Red 903 comes in while Red 52 is still in the box. Red 52 has sat 36 seconds. Your paperwork would look like: Jam 5, Red, 903, B, 36, 1:26, 1:36. It gets even more complicated if there are three blockers in the box, especially if it's a constant, fast paced, penalty heavy game. Furthermore, you have to fill in the paperwork for your jammer and remember to get the times off the penalty box manager. Overall, I had a fantastic time. Everyone was lovely, I got to work with some of my favourite officials, I met some wonderful new ones, and my vegan cookies went down very well! 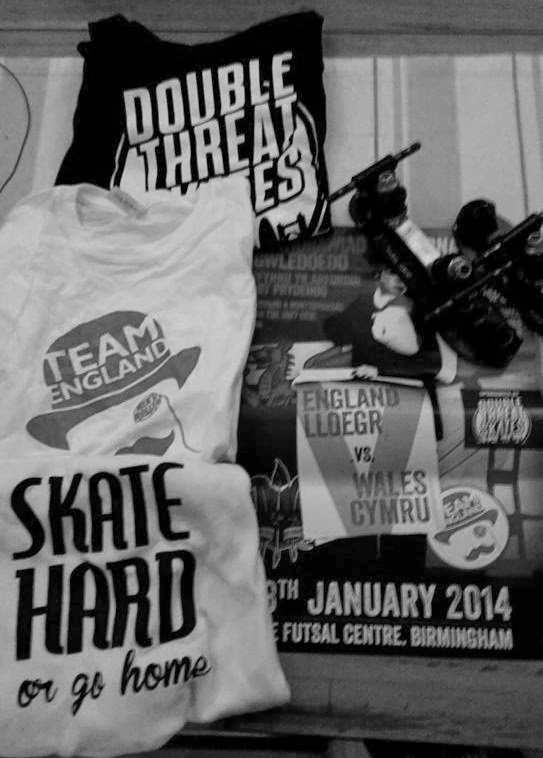 I was a little sad that I didn't get much time to properly browse the merch stalls and to talk to some of the skaters manning them, but I did manage to pick up some goodies during half time.